Can I just ring you? For many years there was a "town roster" with each GP taking turns to be on-call for all the patients of those on the roster. This was extremely stressful for the on-call GP and was not particularly satisfactory for major emergencies, particularly after the loss of surgical services in Hawera Hospital. Smaller groups of GPs then established their own rosters and an A&E was set up at Hawera Hospital, which improved things for major emergencies but created conflicts and loss of continuity of care for patients. When the A&E contract came up for renewal, a tender by the majority of GPs was at the time rejected by Taranaki Health in favour of one by White Cross. This arrangement initially appeared to continue the conflict and a separate GP after-hour single site was planned until it became clear that combining the Emergency service and the GP After-hours service at one site in co-operation would provide a more efficient and "seamless" emergency/after-hours service for South Taranaki with much of the medical "manpower" provided by GPs. The decision to charge for GP type consultations (Triage groups 4 & 5) and surcharge accidents in these categories, enabled this amalgamation to succeed, while serious emergencies (Triage groups 1-3) remain free (funded under a TDHB contract). Subsequently the contract to provide emergency services was taken over by SouthCare Emergency, the operating arm of the South Taranaki Medical Trust and all the GPs (not just those in the Trust) continued an after-hours arrangement with SouthCare. However, this arrangement proved unsustainable, with the TDHB contract plus all the income from charging the non-emergency 4 & 5 groups not covering the medical staffing costs for meeting the emergency service. From the 2009 a new system is in place with only emergencies seen and only by TDHB staff. Emergencies: Patients of this (and other South Taranaki practices) are asked to attend the Emergency Department (ED) of the Hawera Hospital (on the North side, using the road access between the hospital and the SouthCare building) ONLY for emergencies and truely urgent problems after-hours and weekends. Non-urgent after-hours problems should NOT be seen at the ED as this will make it harder for urgent problems to be seen and make staff retention very difficult. 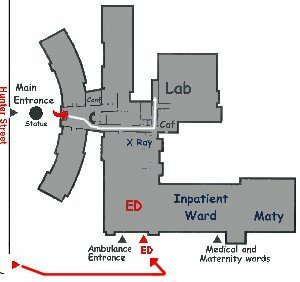 Please note that if you do attend the ED for a minor problem, you will have to wait quite a long time but you will be assessed although you may find that only essential treatment will be given (don't expect repeats of prescriptions or second opinions). If you are not sure if you should attend, you may ring 0800 Healthline (0800 611 116) and a trained nurse will advise if you should. Please NO NOT abuse the Emergency Service or the staff (who try their best but are only responsible for emergencies). If you do misuse or abuse ED, we all risk losing this valuable service and our practice will not support you. There is access to GP after-hours services up to 8pm every day in New Plymouth where a GP can see you and then communicate with us on the outcome (with your permission) so you may consider using this service if the problem isn't that urgent that it needs to be seen at ED or justifies disturbing me after-hours. MediCross Accident & Medical Clinic at 8 Egmont St (down the hill from Centre City near the Windwand) - see map. WHY CAN'T I JUST RING MY GP? You can, if you believe the problem cannot wait until the practice re-opens but isn't an emergency needing ED. However the high "burnout" rate among rural GPs, not to mention the high divorce rate, primarily relates to excessive "on-call" expectations by their communities. As it is I am already on 24/7 for obstetric patients, back-up to midwives, for palliative cases, rest-homes and as a Medical Referee, we ask our patients to avoid "convenience calls" (in which case you should consider the A&M back-up in New Plymouth). Please respect that, as excessive inapropriate demand will risk the loss of this GP altogether. If required I can be contacted on 0274445135. Maternity patients should first ring the Maternity Unit at the hospital [(06) 278 9911].